We believe that everything in the Universe is interesting if looked at closely enough, for long enough, or from the right angle. See here for a fuller explanation of QI Theory. A swarm of gnats is called a "ghost". RSS feeds for QI can be found here. Whole editions of older series of the TV show can be seen regularly on Dave or in short clips on YouTube. Series A-C can be purchased in DVD format. The trusty QI researchers or Elves have been known to make the odd small mistake. Our viewers and readers are never shy about letting us know when that happens, and we are always pleased to learn more so we've decided to collect together the most common 'quibbles', along with official responses from the elves responsible, in our Qibble Blog. If you're bursting with questions - or answers - come in and join the QI Talk Forum where you can chat with like-minded people. You'll be quite interested to discover that the exact opposite of what is generally believed is often closer to the truth. If you want QI in three dimensions, there is a rather diverting range of books, games, DVDs and gewgaws available in our online Shop. QI has a regular column in the weekend Telegraph. You can find a mix of letter-based facts and short essays that show 'the scenic route' through everything that's quite interesting. Those with a fanatical interest in the minutiae of QI might enjoy the lengthy Wiki article about us, which is a labour of love by somebody and seems to be pretty accurate. Oh joy and jubilation. Those jocose jackanapes and jovialists are back with - yes you guessed it - the long-awaited 'J' series of QI. Prepare yourselves for a new collection of jocular jousts as the teams learn all about the letter 'J'. The first episode sees Bill Bailey, Victoria Coren and Jimmy Carr join Stephen and Alan for a trawl through the world of JARGON. Join us to find out the difference between Jankers and Jiggers, what Stalin had in common with Chuck Berry, and why Sherlock Holmes was never quite as relaxed as Watson. As usual, each episode will be screened on BBC2 on Friday nights at 10pm, followed by an extra-long repeat the following night on Saturday evenings at 9pm. Welcome to the next few months' worth of mind-expanding entertainment. On 8th September at 21:00, Swedish TV began airing their very own series of QI (or "Intresseklubben" as it's known over there). The Swedish series "A" will air on SVT channel one, the Swedish equivalent of BBC, with the well known comic Johan Wester as program host. You can view the entire first episode by visiting the SVT website. Anders Lenhoff, Producer of Sweden's QI, says "Let's just say that I thought QI was a totally brilliant idea the moment I heard it; I share John Lloyd's idea that curiosity, seeking of knowledge and entertaining conversation can lead to a better world. Sort of. If nothing else, there is an appalling lack of curiosity, knowledge and entertaining conversation in the world today. Let's try to change that, in our own small way." You can find out more about the show (assuming you can speak Swedish) on the SVT website, or you can follow Intresseklubben on Twitter or on Facebook. Here at QI Towers, we won't be satisfied until the message of QI has spread right around the world. 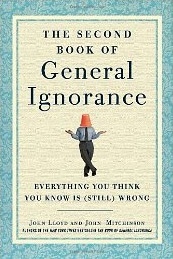 To that end, we recently released a US edition of our best-selling Second Book of General Ignorance. So far it seems to be going down pretty well. Certainly Craig Wilson of USA Today liked it a lot. You can read his full review of the book by following this link. Any US citizens who are keen to find out what all the fuss is about can find the book on Amazon, though we are duty bound to point out that other booksellers are available. Any UK completists who just have to have the US edition to sit on their bookshelves alongside the UK version can find a copy on Amazon UK .